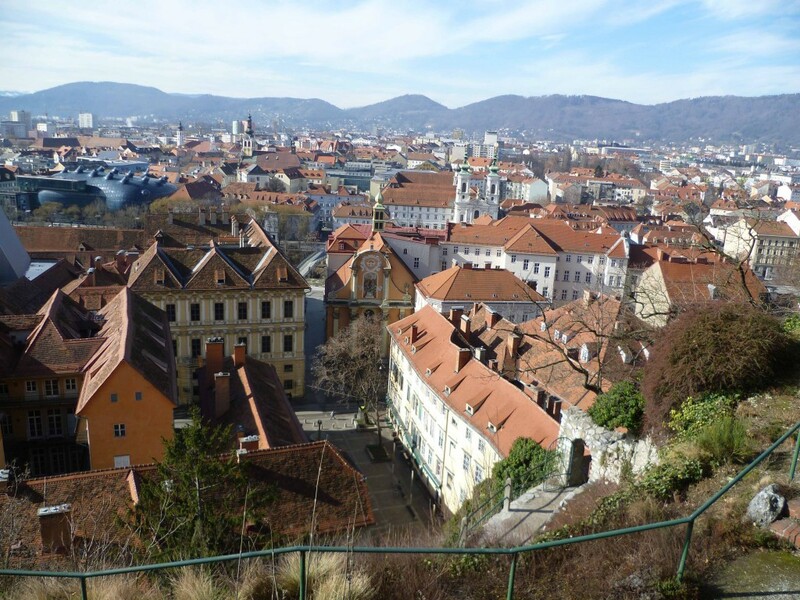 This years eMOOCs conference took place in Graz (Austria) and the SOONER team was highly represented. At the last conference day we gave a workshop about scalable feedback and assessment activities in open online education. During the workshop we tried to get insight into the possibilities of extending rich learning activities to high student numbers. What we often see in MOOCs is that they already apply learning activities that are suitable for high student numbers, such as watching videos or making quizzes. On the one hand, providing students with high-quality video material is a learning activity that can reach thousands of students. Nevertheless, the amount and quality of what students learn from videos can be limited. On the other hand, high quality learning activities such as simulations are not easy to scale up, yet enable students to engage in complex learning activities. However, when looking from an educational quality perspective the meaningfulness of such learning activities is limited. The meaningfulness of a learning activity depends on several aspects such as enabling students to link their gained knowledge to existing knowledge and to the real world, acquiring new and/or applying their skills. We see educational scalability as the sensitivity of a learning environment towards the numbers of learners participating. It ensures educational quality and is neutral towards teacher bandwidth. We want to approach this scalability challenge by focusing on three aspects: (1) cost, (2) quality and (3) scale. The cost aspect, within this research, includes mainly teacher bandwidth. Limited teacher time is an important and limiting factor in open online education and therefore should be taken into account when designing courses for large scale. One way to influence the cost aspect is by focussing on the interaction types and interaction richness that takes place between students, teacher and the course material. According to Anderson (2003) six interaction types can be distinguished, see Figure 1. Interaction is an important aspect during learning and in order to engage in deep and meaningful learning, students require support and feedback (Anderson, 2003). Since the teacher time is limited it is important to minimize student-teacher interaction. When minimizing student-teacher interaction, other interactions for example those between students (student-student) should be more dominant. 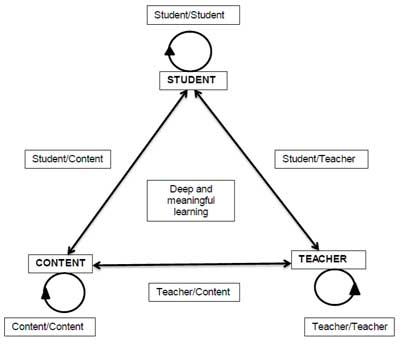 It is said that students should engage actively in relevant learning activities to construct knowledge and to achieve the intended learning outcomes but how can we enable this in MOOCs with thousands of participating students (Biggs, 2003; Blumberg, 2009)? The quality aspect in this research will be approached by focussing on constructive alignment and task complexity. 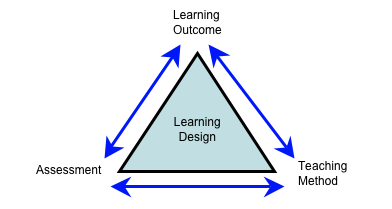 According to the concept of constructive alignment, learning goals/outcomes should be aligned with learning activities and assessment (Biggs, 2003). This means that there should be a consistency between what students are ought to learn and the way students are taught and assessed see Figure 2. Sometimes a discrepancy is seen between the complexity level of the intended learning goals and the actual complexity of learning activities and assessment. When striving for learning goals on a high complexity level such applying skills in (simulated) real-life situations students should be offered learning activities that match such a level in order to acquire the learning goals. How can we design learning activities on a high complexity level, that are suitable for high student numbers, without putting too much burden on the teachers? When trying to improve the scalability of open online learning and assessment, several aspects should be taken into account. It is clearly not enough to provide high scale learning activities that do not provide students with deep learning experiences.